Nothing like a little alien possession and romance to make my day 😛 This is the story of Cho UNO, a typical high school girl. She is average looking, shy, and not all that popular. She is in an unhappy situation. She hates a boy in her class. In fact, she hates him so much that she prays to god to strike him dead. Who is the target of her hatred? None other than one of the most popular guys at her school, Shin TSUBAKI. He is tall, handsome, and athletic. How can she hate such a guy? Well actually, she used to have a huge crush on him, back when she was a freshman. She admired him from afar. Then the next year she ended up in the same class as him, and discovered how rude he is. Seriously, Shin is an arrogant, mean guy. He is surly, growls at poor Cho, and insults her to her face. He is just cruel! So Cho does NOT like him anymore. She wishes he would go away. 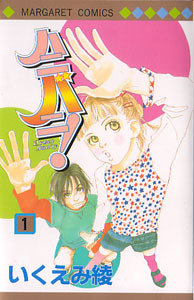 And guess what, this is a shoujo manga, folks, and that is exactly what happens! Cho gets her wish in a very unusual way. One evening Tsubaki ends up posessed by an alien! The alien takes over Tsubaki’s body. And wow, what a difference! “Shin-sama” is suddenly sweet, cute, curious, and incredibly nice to Cho. He completely controls Tsubaki’s body, but cannot do so at all times. He eventually gives control back to Tsubaki, who finds himself waking up in strange places with no memory of how he got there! Cho is the only one who knows the truth of the situation, and Tsubaki begins to suspect she has something to do with his strange blackouts! Poor Cho, having to deal with the adorable Shin-sama, who looks at her through the face of Tsubaki, a guy she likes and hates at the same time! And poor Tsubaki, having no control over these strange blackouts and no idea what is happening to him! What a strange three-way relationship!